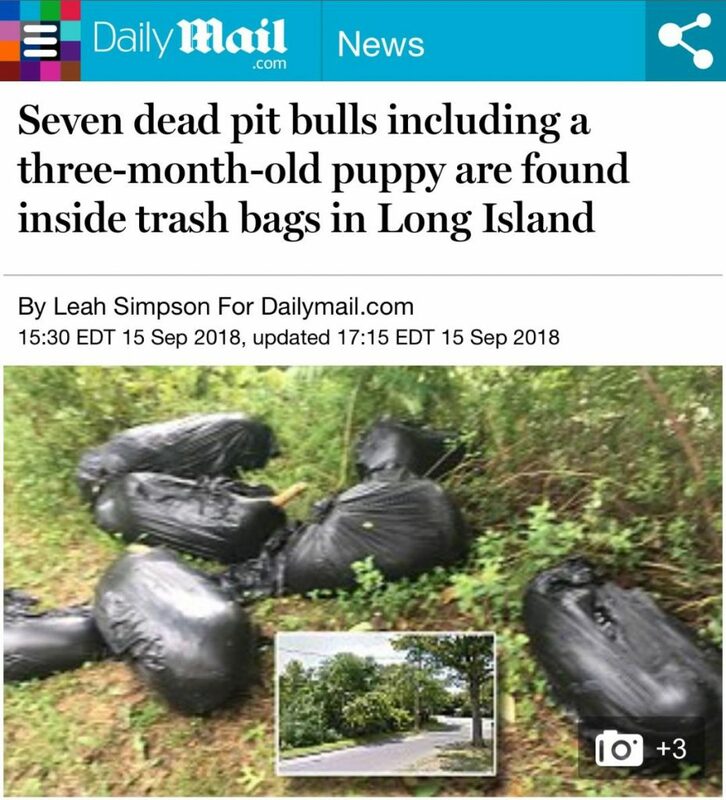 The Nassau County Society for the Prevention of Cruelty to Animals is offering a $5,000 reward for information leading to the arrest and conviction of the person or people who placed seven dead pit bulls in trash bags. If you know something, say something!!! Anyone capable of doing this likely has humans in bags somewhere too. And to those who believe pit bull type dogs are dangerous, you are of touch with reality and wildly uneducated. Human beings are unpredictable and a danger to society and they prove that every single day. The horrors humans inflict on pit bull type dogs daily is a direct reflection of our broken society. Until our society makes ending the abuse, discrimination and murder of these dogs a priority, violent sociopaths will continue to freely walk and live among us and will go on to commit crimes against humans. So, if you want to vote for people against these dogs (the victims) and insist on sitting back and letting the “animal people” handle things cause you’re “not a dog person” then don’t cry or whine when one of these sociopaths assaults, robs, rapes or kills someone you love. I strongly encourage you all to share this article and this message far and wide because it’s not theory, it’s fact. And while we can’t stop all killers, we most certainly can do more. People outside of the animal community need to be educated and get involved on any level. These dogs are not garbage in bags. They are innocent lives who depended on HUMANS and HUMANS once again failed. This is absolutely intolerable, infuriating and sadly, common. I get sent photos and stories nonstop that make my stomach sick and sadly this is just one of many. It never stops being devastating.